This collection of resources helps explain the services available to TAACCCT grantees from OPEN in relation to meeting requirements for deliverables. Other support material is also listed below, including guides for best practices when marking content, OER management, and for universal design for learning and accessibility. This video explains the Creative Commons Attribution (CC BY) license requirement for U.S. DOL TAACCCT program grantees. Video produced by Intelligent Television, Inc and licensed to the public under CC BY. The School of Open also offers online tutorials and courses on topics like open educational resources, copyright, and more at schoolofopen.org. Not sure where to start? We recommend you Get CC Savvy with a 30-minute challenge! CAST has launched a new website, entitled On Campus: Universal Design for Learning in Higher Education (http://udloncampus.cast.org). This site aims to help grantees use Universal Design for Learning (UDL) to address learner variability. The website offers resources geared toward multiple stakeholders in postsecondary institutions to help them use the UDL principles to improve learning opportunities, retention, and outcomes. 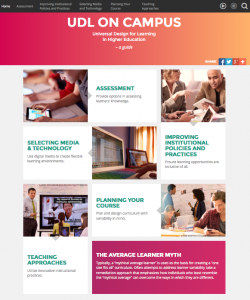 Whether grantees are making curriculum or technology purchasing decisions, thinking about individual courses or an OER strategy, the resources on this site focus on the basic premise of UDL. This premise is that the most effective and scalable innovations occur when efforts are made to meet the needs of “students at the margins” from the beginning, as innovations that are essential to some end up being beneficial to many (Meyer, Rose, & Gordon, 2013). The website supports grantees in the application of UDL across the following five areas: (1) Assessment, (2) Improving Institutional Policies and Practices, (3) Selecting Media and Technology, (4) Planning Your Course, and (5) Teaching Approaches. OPEN has worked closely with the National STEM Consortium to develop a three-unit, 45 hour course in STEM Readiness, designed to provide a refresher in core skills necessary for STEM careers. The course is available for use by independent learners or to support more formal instruction, including online, hybrid and flipped classroom approaches. Units in mathematics, communication and professionalism are currently available and have been used by over 500 NSC students and thousands of learners outside the consortium. Data from these interactions is being used to plan for continued iterative improvement to the courses. Visit the OLI website to preview and use the course. This course offers an overview of healthcare, health information technology, and health information management systems, focusing on the role and responsibilities of entry-level health IT specialists in each phase of the health information management systems lifecycle. The curriculum is aligned to the new Certified Associate in Healthcare Information and Management Systems (CAHIMS) certification, designed for students who have previous experience in IT or healthcare as a pathway into health IT careers. This course is a collaborative effort of TAACCCT grantees, in particular Bellevue Colleges and MoHealthWINs. We are looking for faculty/content experts who can participate in the design of and write the content for learning activities and assessments that support students to achieve key learning outcomes and overcome common misconceptions. The faculty/content experts do not need to participate in the design of the entire course but rather can choose one or more module(s) in which they have expertise. Please contact us if you are getting involved in use or authoring. In the initial release, six of the eight modules are available (in bold). The remaining two (in italic) will be released as they are built. Additionally, OLI is working to develop a series of corresponding one-page “quick tip” documents that can be used to address a variety of instructional issues. The list of topics created to date and links to the PDF documents can be found at http://oli.stanford.edu/resources. WA State Board for Community and Technical colleges officially invites all TACCCTT grantees to our “How to use Open Educational Resources” online training course in January 2014. The purpose of this course is to provide information and experience in using open educational resources (OER) in your teaching practice. Concepts of OER and open licenses will be discussed, and the course will also provide practice in locating and sharing open educational resources. This is a 2-week online, asynchronous course and participants are expected to spend 10 hours to complete the course. This is a fully facilitated training that will produce an official certificate to the participants upon successful completion. Identify resources that are openly licensed or in public domain. Find the open educational resources, and properly attribute their authors. Mark their work with Creative Commons licenses. To register for the training, please simply email the instructor (Boyoung Chae at [email protected]). We will manually add you to the Canvas training shell and you will receive the invitation that will prompt you to create a Canvas account (if you don’t have one already). For more scheduling information about free online training for TAACCCT grantees from SBCTC, see http://www.waol.org/info/training/instTrainingRegV2.aspx. As part of a research fellowship with the OER Research Hub (OERRH) at the Open University, Billy Meinke (Creative Commons) will be delivering surveys and conducting interviews with select TAACCCT grantees, exploring knowledge and perceptions of open copyright licensing, open educational resources (OER), and collaborative learning resource production. For more information, contact billy [dot] meinke [at] creativecommons [dot] org.